With the launch of their easy-to-use online reservation process for consumers, Volkswagen unveils a special launch edition of the 2012 Beetle. The first model available for pre-order will be the turbocharged Beetle 2.0L TSI, in a limited run of 600 Black Turbo launch edition models. 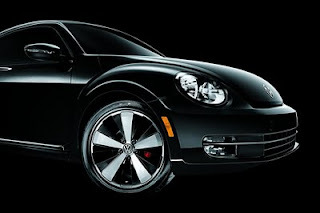 Priced at $24,950 USD, the special edition is fitted with Volkswagen’s DSG® dual-clutch automatic transmission and the acclaimed 2.0-liter, in-line four-cylinder turbocharged engine that produces 200 horsepower and 207 lb-ft. of torque. In addition to the turbocharged performance features, the four-cylinder engine offers an EPA fuel economy rating of 30 mpg on the highway when outfitted with the automatic transmission. The simple program involves the following steps: consumers access the pre-order site here and enter their zip code and review key program terms; select a dealer for retail delivery; enter and confirm billing information; and finally, receive a notice that their welcome kit is on its way.